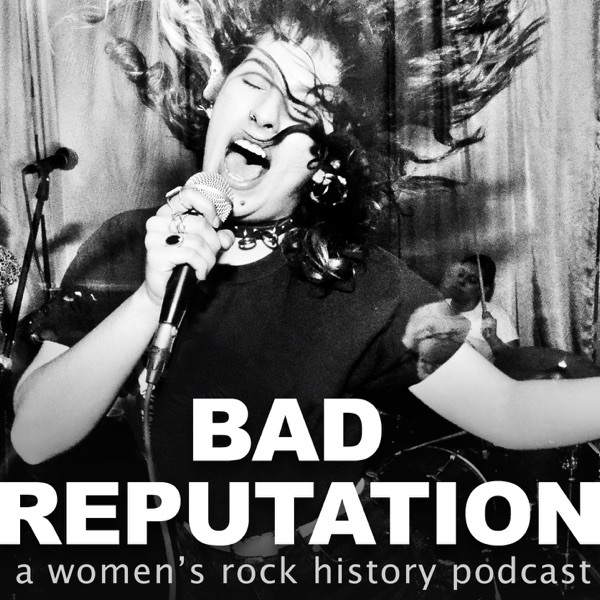 Bad Reputation tells stories about women in rock. The lost stories. The complicated stories. The good stories. Host Micco Caporale reads the stuff you don’t have time to read and tracks down the people you don’t know how to find so you get stories you’ve been desperate to hear. This podcast mixes history, re-enactments, and interviews to push girls to the front. Get your headphones ready. In this episode, Cherie Currie and Jackie Fox join the Runaways, and co-founding member Kari Krome leaves. There's also some myth-busting of popular Runaways lore such as the origin of "Cherry Bomb,” an introduction to Hollywood punk icon Pleasant Gehman, and some exploration on the social and cultural obstacles that made/make taking a stand against abusive figures like Kim Fowley, difficult. Content warning: This episode discusses sexual violence. Jackie Fox was into surfing — in part because it was a sport not many women participated in, and Jackie didn’t just like trying new things; she liked forging paths. Cherie and Marie Currie in matching shirts from the Strawberry Fields Festival. Stevie Nicks and Steve Jones have also been photographed in this shirt. This season of Bad Reputation would not be possible without the work of journalist Evelyn McDonnell and her book Queens of Noise. If you are looking to learn more about the Runaways, this is a must. I read, watched, and conducted as many interviews as possible to make this podcast. Only a fraction of the interviews I find or conduct appear in episodes, but all voice-acted parts are dramatizations of real quotes or interactions described in written interviews. If you have a question about where a specific piece of information came from or would like to provide a source for correcting something, please reach out! Early photo of the Runaways featuring Joan Jett, Cherie Currie, Lita Ford, and Jackie Fox. Culture doesn't exist in a vacuum, and my voice actors are the people whose ideas, influence, and encouragement shape my work. If you like this podcast, you will probably like many of their projects, too. Cat DeBacker (Cherie Currie) is a culture writer. Scott Plant (Kim Fowley) plays in the band Droids Blood. Kat Buckley (Lita Ford) is an art historian and curator. Johnna Jackson (Joan Jett) is a writer and organizer. Molly Claire Berkson (Jackie Fox) is a print artist. Culture writer KT Hawbaker was a developmental editor for this episode. Bad Reputation's logo photo is by photographer Martin Sorrondeguy aka Martin Crudo. Belinda Carlisle, Pleasant Gehman and Wyline. Photo by Theresa Kereakes. All music that appeared in this episode is from a royalty-free music library or the creative commons, with the exception of the outro, which is “Wavelengths” by Death Valley. (Seriously, pre-order their upcoming record. You won’t regret it.) The soundbyte of Kim Fowley describing himself as sexually abusive is from The Mayor of Sunset Strip. If you’d like to hear licensed music in future episodes — me too! I’d also like time to research much rarer history. You can become a Patreon to help me work towards both goals here, but you’re always welcome to make a one-time Venmo donation to @MiccoSlays, too. Apart from money, the biggest thing you can do to support the show is to tell anyone you can. You can also rate and review it on iTunes. Every listener and listener review helps, and I truly appreciate it. At their inception, the Runaways were a trio of raw sound and teenage ambition. But Micki Steele, their original bassist and lead singer, was quickly pushed out of the band. Almost 10 years later, she found a home in the Bangles, a band that gave her more commercial success and creative satisfaction than the Runaways ever could. But what happened between leaving the Runaways and joining the Bangles? In this episode, I used two clips from audio interviews with the real Michael Steele. The first came from an interview on the BBC6 in 2003 and the second came from the VH1 Behind the Music Bangles episode. Culture doesn't exist in a vacuum, and my voice actors are among the people whose ideas, influence, and encouragement shape my work. If you like this podcast, you will probably like many of their projects, too. Clementine Wink (Susanna Hoffs) plays in the band Civic Center. Eli Harvey (Sandy West) is a writer and comedian. Josh Watkins (Phast Phreddie Patterson) is a writer. J.R. Nelson (heckler) is a music critic. KT Hawbaker (Michael Steele) is a culture writer. They also worked as developmental editor on this episode. If you’d like to hear licensed music in future episodes — me too! I’d also like to research much rarer history. You can become a Patreon patron to help me work towards both goals here, but you’re always welcome to make a one-time Venmo donation to @MiccoSlays, too. Apart from money, the biggest thing you can do to support the show is to tell anyone you can. Every listener helps, and I truly appreciate it. The Runaways were the first all-female hard rock band to achieve mainstream success, but they had a famously abusive manager. How did this affect the band’s development, and where did women who refused to work with the Runaways’ manager… end up? In this first episode, we’ll start exploring these questions. You’ll also meet Kari Krome, Joan Jett, Sandy West, and Micki Steele — and get a taste for how their rock ambitions helped pave the way for Los Angeles punk. Cat DeBacker (Cherie and Marie Currie) is a culture writer. Hayley Jane Blackstone (Kari Krome) is in the band Red Delicious. J.R. Nelson (Ritchie Yorke) is a music critic. Educator, artist, and publisher Dushko Petrovich was a developmental editor for this episode. All music that appeared in this episode is from a royalty-free music library or the creative commons, with the exception of the outro, which is “Wavelengths” by Death Valley. (Seriously, pre-order their upcoming record. You won’t regret it.) I also used excerpts from Almost Famous and The Runaways.